The moon is so fickle. 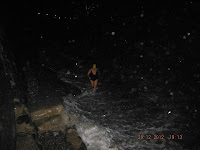 Every month I attempt a moonlit swim; I rarely achieve it. Last night we had yet another go. Jackie, Allan, Yaara and I met at Anstey's Cove, in Torquay; on the way over, Yaara and I had watched the moon rise over Newton Abbot - it was huge and orangey and low in the sky. As we approached Torquay though, it started to pour with rain. Down at the cove the moon was obscured by a huge cloud, though it did come out for about four seconds, raising our hopes momentarily. We decided to try our luck at Meadfoot, as it was too dark to get down to the sea at Anstey's safely. At Meadfoot the moon remained stubbornly stuck behind a cloud; the sea was lively, with big waves crashing onto the prom. We ran in, and bobbed in the obscure grey light. After swimming around, vainly hoping for the moon to appear, we came out. Just as we were finishing changing it emerged majestically above the clouds, casting a silvery beam on the sea. 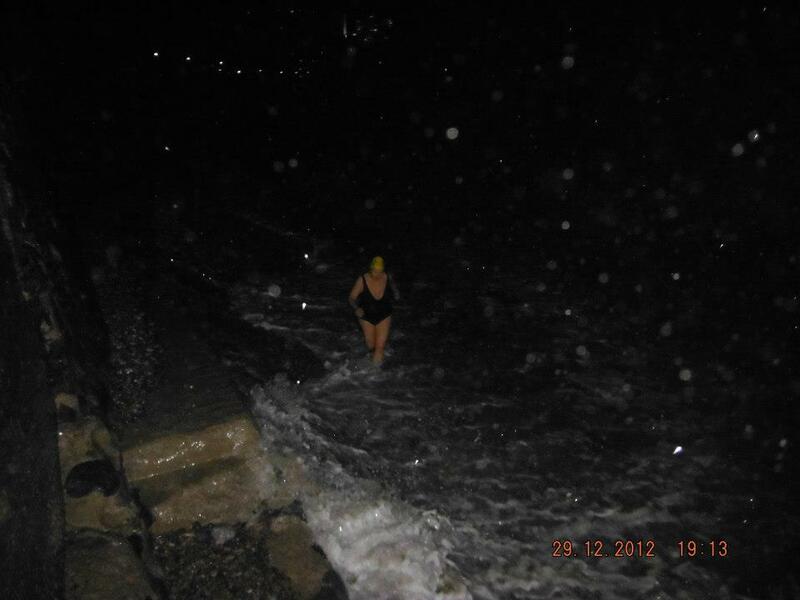 In this 'inbetweeny' time twixt Christmas and New Year it is good to get out and walk (and swim of course). I try and engineer things so everyone is happy - and I get a swim in at the same time. Today we walked through the Valley of the Rocks between Watcombe and Maidencombe in Torquay. The path plunges up and down through jungle-like woods, where ivy hangs everywhere and primitive ferms abound. You squelch through brick red mud before arriving at the pretty beach at Maidencombe. It was all very damp; I got changed beneath the cafe, getting muddy feet as I did so, and and headed down into the grey sea, which tasted exeptionally salty. I stuck my head in and swam towards the horizon, where two red cargo ships sat immobile. Gannets, with their beautiful black wing tips, soared overhead. 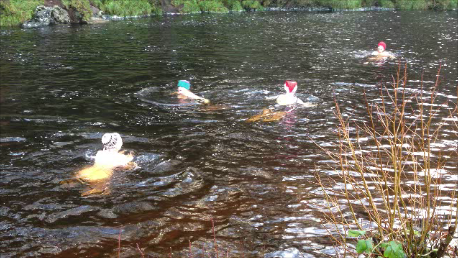 We were meeting for a reprise of our Christmas swim last year. The venue was the same - Burgh Island - and we were hoping to swim round. But as soon as we drove over the brow of the hill and saw the water, I knew it was not to be. Great herds of white horses were galloping over a huge brown sea; it just didn't look safe. Dodging the showers, we assembled in our Santa garb and strode out over the empty sands to the surf, where we jumped and frolicked in the massive rollers. We then headed off to the Mermaid Pool, hidden around the side of the island, for some calmer swimming and diving. Thanks to all the wonderful Devon wild swimmers who brought good cheer as well as numerous mince pies, cakes and mulled cider. Merrie Swimming!!! A new winter trend is emerging...and with it a new sartorial movement I am calling 'bag lady swimming'. The trend is for early morning Sunday dips in the Dart...and we are discovering that the most efficient way to do this is to set off from home in cossie, dressing gown and wellies, preferably accessorised with mismatching gloves and hats. (the only problem with this if course is if one is being collected and has to stand out in this garb in the road). However, practically speaking, this really works. You get to the river, strip off, and are in. On getting out, it's a quick rubdown, sling on the dressing gown and away you go. The look here is modelled by Rachel and Yaara. Note the final touch - a carrier bag - it adds that certain 'je ne sais quoi'. We gathered for a birthday bob at Beesands, where the shingle and the sea stretch for miles. As we entered the water the beach dropped away under us and we were cast into vastness. The sea is so clear here, and the sound of the pebbles relentlessly churning back and forth underneath is quite mesmerising. It was fiendishly fresh but so invigorating too. Afterwards we sat in the Britannia cafe and ate crab soup, looking out on the congers drying to be bait for the pots. Toasting in my bed on Sunday morning, I wasn't that enthusiastic about the idea of a dip in the freezing cold Dart. Temperatures have bombed in the last few days. But when we arrived at Spitchwick I immediately felt excited; the ground was frosted and white, and the delicate branches of the trees pointed nakedly into the sky. Our attire ranged from nothing at all (Judy - what a woman) through cossie/glove combos (Anna, Yaara and Rachel) to full wetsuit, boots, and gloves topped with Russian fur hat (me). The hat, while incredibly warm, is very big and came over my eyes, somewhat cramping my style and prompting comparisons with those soldiers who stand outside Buckingham Palace. The air temperature was 0.6, while the water was 3.2; where would you rather be?